Rethinking Faith and Church: Liturgical Dance? When I first saw this cartoon I thought, “Wow, this ought to stir up a hornet’s nest!” At first I didn’t know whether to laugh or be offended. In my case, laughter won out. Perhaps you’re also wrestling with the same sentiment. If offence wins out in your case, I ask your forgiveness. But the more I thought about it, the more I saw something else in it besides the “Liturgical Dance.” Maybe the artist wanted us to see more in it too. Now read between the lines. The message being presented (or at least the one I’m receiving) is that ultimately, what matters most, is getting people (and in this case, the dirty-minded old men?) back into the institutional church pews. The method by which it’s done doesn’t really matter, for as everyone knows, the ends justify the means. But do they really? How many other things has institutional Christianity done over the years in an effort to lure outsiders into her midst? Well, I guess the answer depends in large part on whom you talk to. I remember another time when I was still serving as an institutional church pastor. I was also a member of a local Christian motorcycle fellowship at that time. One Sunday the quiet church neighborhood was awakened to the roar of several motorbikes, as their riders came to church dressed in full leathers and filling two entire pews. Needless to say, they turned a lot of heads, not to mention breaking a few dearly held traditions. I, for one, was happy with the extra “numbers.” By turning aside some of the age-old traditions, we were also able to say, “… are coming back to church, now that we’ve introduced …”. At the risk of sounding too critical, the point is that the goal of much of what is done on any given Sunday by any given institutional church system, has to do with numbers. I know there are some who will take exception to that. However, survey the participants of most pastoral conferences, and they will tell you, if they’re honest, that sooner or later the discussion often turns to numbers. “How many people in your church?” asks one pastor of the next. “Oh, we average *** on any given Sunday,” comes the reply. I have not only witnessed that first hand, but have been guilty of it myself as well. The numbers game says, “… are coming back to church, now that we’ve introduced …”. The fact is, many people do “shop” for just the right church. This became evident again as I read some of the testimonies in the book, “Finding Church” (Civitas Press, 2012). In and of itself, this is not wrong. After all, who doesn’t want to worship and fellowship in comfortable surroundings with like-minded Christians? Church leadership knows this, and so a lot of thought goes into programming and style in an effort to be as palatable as possible to as many as possible, to lure as many as possible, and to retain as many as possible. 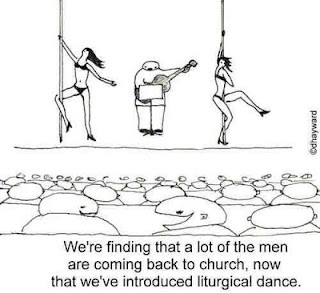 I am certainly NOT suggesting that pole dancing (or as the cartoon facetiously calls it, “Liturgical Dance”) by loosely clad women is even remotely justified in Christian ministry. Yet it is interesting that the Bible too has a story in which at least one person, the king’s wife, thought her husband’s dancing before the Lord was a little too revealing and risqué. “As the ark of the Lord came into the city of David, Michal the daughter of Saul looked out the window and saw King David leaping and dancing before the Lord, and she despised him in her heart … And David returned to bless his household. But Michal the daughter of Saul came out to meet David and said, ‘How the king of Israel honored himself today, uncovering himself today before the eyes of his servants’ female servants, as one of the vulgar fellows shamelessly uncovers himself!’” (2 Samuel 6: 16, 20; ESV). Where do we draw the line between the pragmatic (if it works to bringing the masses in, it must be OK view), versus recapturing God’s true plan for the church? What is God’s true plan for the church? Do ends justify the means when it comes to church growth? What do you make of the so-called “numbers” game? 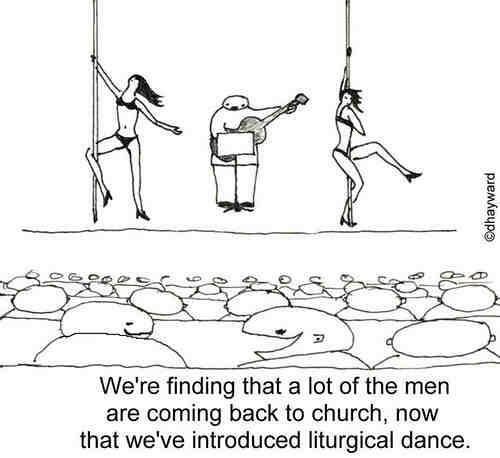 Have you ever witnessed “liturgical dance?” Just kidding. Don’t answer that. Photo Credit: David Hayward (nakedpastor.com) Used by Permission. It's the old story again, isn't it? Should we engage in 'attractional church', or should we focus on 'missional church'. David Hayward's cartoon captures the attractional argument very well indeed. By taking it to a ridiculous extreme he gets the message across. I love the way you've spelled it out here in your post too. Gathering together is important, but it will always be focussed on those who are already following Jesus. It's a club for the converted. The value of that is for encouragement and hearing from the Spirit and building one another up in love and teaching and so on. That's good and it's necessary. But the other aspect is going out to bless and share. That's important too, maybe even more important, and often overlooked. Here's one man's plan for achieving it. What do you think? That is what attracted me to the cartoon as well; the "ridiculous extreme" most certainly does get the message across. Thank you too for sharing the link. I will check it out more fully .